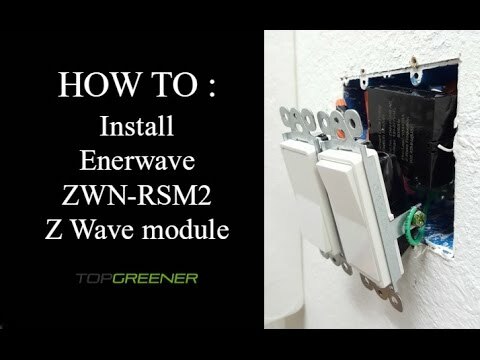 Enerwave Z-Wave Plus ZWN-RSM1-Plus hidden smart switch converts any standard On/Off switch into a smart switch for wireless control using mobile devices. ZWN-RSM1-Plus utilizes Z-Wave Plus, the latest and most advanced Z-Wave technology, which provides longer battery life, faster operation, better RF coverage and easier installation. Z-Wave Plus unifies all of your home electronics into an integrated wireless network and helps them communicate with each other. The ZWN-RSM1-Plus is designed to be installed and "hidden" behind the current switch to enable wireless control of your light, fan and other electrical appliances from any distance. Works with Alexa; Z-Wave hub and neutral wire required. Single Pole, 120-277 VAC, 50/60Hz, Up to 150ft Range, 10,000mA (10A) Maximum Load, 908.42MHz, Slim Design - Dimensions: 1.63" x 1.63" x 0.82"